HSO take a look at how retailers can plan a positive future bringing together online and in-store. Convenience is critically important for UK consumers today. The online world increasingly delivers it, with traditional bricks and mortar shops often perceived as trailing behind. That’s perhaps one reason why an HSO-commissioned survey conducted in early 2019, polling the views of the UK public, revealed strong support for High Street retailers bringing elements from online shopping into the world of physical shops. When asked which elements they would like retailers to move in-store, many highlighted options that both accelerated the purchasing process and made it more convenient. More than a third (38 per cent) referenced ‘use physical sites as centralised pick-up points for online orders’, while 42 per cent cited ‘introducing technology to speed up the buying process in-store.’ The most popular option, however, referenced by 73 per cent of the sample, was ‘having screens in-store that ‘allow you to quickly browse what stock is available of a certain item, where to find it and enable you to place orders too’. This emphasis on stock, points to two of the biggest but least heralded benefits of online shopping – the breadth of stock on offer – and its high level of availability, both of which make it more convenient to customers. The survey found shoppers were most attracted to going online by the choice available. 59 per cent of respondents referenced ‘breadth of product range’ as a reason for using the online service offerings of leading digital brands over those offered by traditional High Street retailers. Moreover, when asked to name the main aspects of online shopping, as opposed to shopping in-store, that make it appealing to them, 53 per cent cited: ‘I have access to a much greater variety of products’. 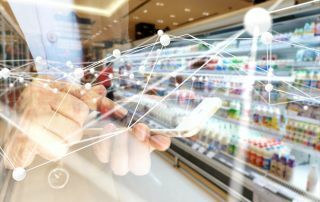 While acknowledging the advantages of the online world here, consumers still believe there is more retailers could do to enhance their online offering in these areas. In response to the question: “What areas of the online shopping experience do retailers most urgently need to improve?”, two of the top four answers spoke to this need. 31 per cent referenced: ‘improve stock availability levels’, while, supporting this answer, 29 per cent highlighted ‘provide a faster, more efficient delivery process’. All the above underlines the importance of retailers having a range of stock in place and keeping levels topped up, both online and in-store. Part of the rationale is a drive to reduce churn. Running out of stock is a big issue for retailers, especially online where consumers have greater expectations around stock availability and convenience is most highly-prized. The survey shows that retailers are likely to pay a significant penalty for this. When buying an item online, if the retailer is showing it as out of stock but suggesting stock is available in a store for collection, consumers’ preferred option is always to source another retailer online, no matter whether the item is clothing, a consumer electronics or DIY product, or a toy or game. It is also true that having a wide range of stock continuously available acts as the key foundation layer, enabling retailers to make additional promotions and offers on top that encourage consumers to buy more and, in some cases, personalise those offerings to their needs.